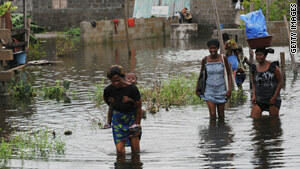 Increased flooding could lead to more cases of diarrheal diseases such as cholera. (CNN) -- The World Health Organization (WHO) held a "side event" for public health officials in Copenhagen, Thursday, in an effort to put public health at the center of the climate-change debate. Diarmid Campbell-Lendrum, a scientist in WHO's Public Health and Environment department, told CNN, "We're reminding people that climate change is not just an environmental issue or an economic issue -- it's a health issue that's actually about people's survival." He said evidence shows that climate change is likely to have very serious impacts on public health, adding that some of these impacts are already taking place, and are likely to escalate in future. Dr. Maria Neira, WHO director of Public Health and Environment told CNN, "The major killers at the moment are all climate-sensitive. "Malnutrition kills 3.5 million people a year, diarrheal diseases kill two million people a year, and malaria kills almost one million people each year. Global warming will probably exacerbate these problems," she continued. Campbell-Lendrum told CNN that increases in global temperature and flooding could both add to the incidence of diseases spread by mosquitoes, including malaria and dengue fever. He added that increased flooding could lead to more cases of diarrheal diseases such as cholera, and there is evidence that heat waves, such as the one estimated to have killed 70,000 people in Europe in 2003, will become more frequent and potentially more severe over the next 30 years. But the biggest health risk may come from drought. "There is some early evidence that climate change is affecting the frequency and intensity of drought," Campbell-Lendrum told CNN. "The real concern is that the projections for the next 30 years are of significant reductions in agricultural production in poor tropical regions," he continued. We have a lot to gain in Copenhagen, or a lot to lose. "Malnutrition kills 3.5 million people a year and it looks like climate change could affect agricultural production in exactly the region where those deaths occur," he said. Professor Andy Haines, director of the London School of Hygiene and Tropical Medicine, headed an international team that recently published research in medical journal The Lancet that highlighted the health benefits of certain strategies for reducing greenhouse-gas emissions. Haines told CNN the research looked at strategies that would contribute to reaching agreed targets for emissions, and found potential "win-win" policies that improved public health as well as reducing greenhouse gases. "We identified policy areas where you could produce substantial health benefits to society over and above the benefits that might accrue from reducing greenhouse-gas emissions," he said. Haines said that by using computer models, the researchers found that encouraging walking and cycling in urban areas could reduce heart disease and stroke by 10 to 20 percent in London, and lead to substantial reductions in a city like Delhi. The researchers also looked at the implications of replacing biomass stoves used in many Indian households. These stoves are used to burn fuels such as wood, crop residues, and sometimes dung, releasing pollutants thought to contribute to climate change. They found that a 10-year program to introduce 150 million low-emissions stoves in India could prevent around two million premature deaths, largely from heart disease and chronic obstructive pulmonary disease. Neira told CNN that policy makers were beginning to understand the health benefits of these kinds of climate change mitigation strategies, and said she welcomed the December 7 announcement by the U.S. Environmental Protection Agency to classify greenhouse-gas emissions as a "public health threat." She added, "Depending on what is decided on Friday afternoon our health will either be in a very good or very bad condition. We have a lot to gain in Copenhagen, or a lot to lose."